When I did my Java Database system for our store, I used iReport 3.0 as a designer for JasperRepor. I had easier time with designing the reports for the database system since the iReport has very easy drag-and-drop and window features. 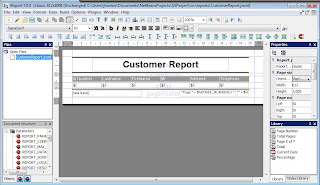 All I did wad connect MySQL database with iReport, set my table fields, customize the report and preview the report. It was only different when I have to filter the reports for an ID or for dates since I have to use customized parameters to connect my Java values to reports.